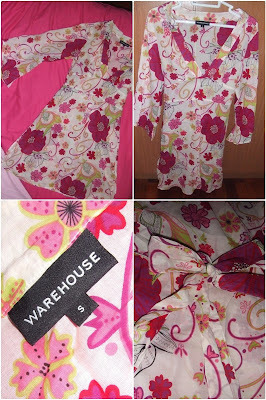 Shazwani Hamid's Blog: Closet Clearance! Okayy.. Since I got lotsa things to be done this week, so I'm just gonna sell my stuff bit by bit kay.. Please click on the pictures to enlarge. Thank You! Description: A stretchable floral top with ruffle detailings at the bust and sleeves. Two layered collar. Verry nice color. Size UK 8 (S). Material: 100% Polyester. 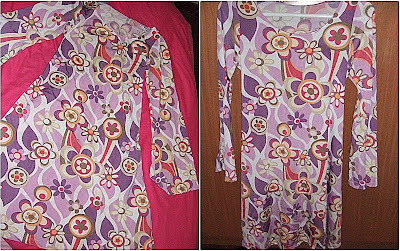 Description: A sweet pink-purple floral long-sleeved shirt with velvet ribbon detailings at the cuffs. Size M. Material: 100% Cotton. 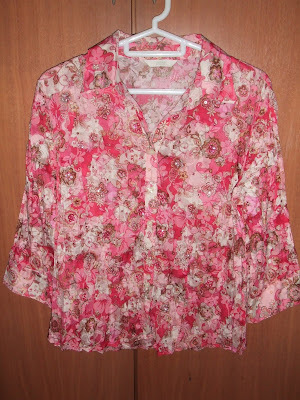 Description: A white & blue floral blouse. 3/4 Sleeves. Size UK 10 (M). It can fit size S too, cuz this blouse is quite small for sized M actually. Material: 100% Cotton. 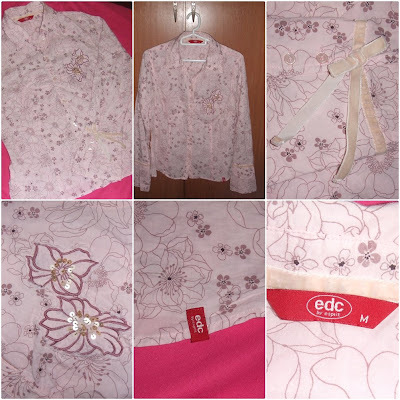 Description: A floral shirt with beads and sequins detailing at the front part of the shirt. Size UK 8 (S). Can fit sized M as well. Material: 60% Cotton 40% Polyester. 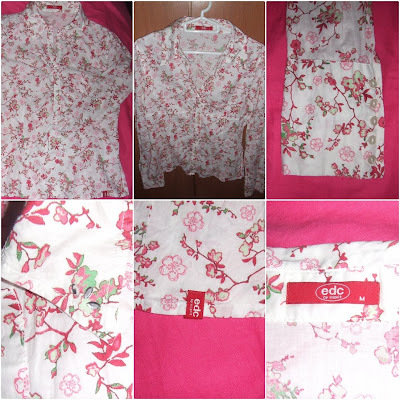 Description: A floral shirt. Size M. Material: 100% Cotton. 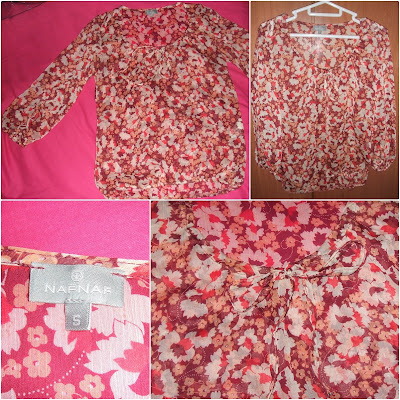 Description: A sheer red/orange floral top. Size S. Material: 100% Polyester. 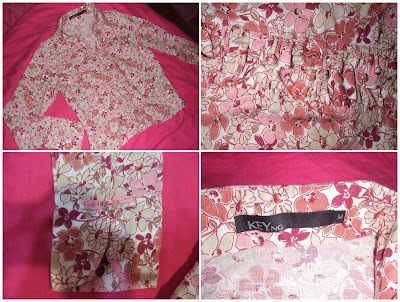 Description: A floral top with frills at the front part, and has Cheongsam-like buttons. Very feminine. Size M. Material: 100% Cotton. 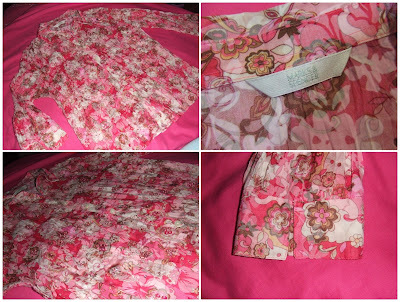 Description: A pink & maroon floral tunic top. Long sleeve kimono style with back tie. V-neck with ruching at the bust. Size S. Material: 100% Cotton. Description: A stretchable tunic top. Size S or M. Material: 100% Acetate. It looks very much the same like this top. Except for the long sleeves and cowl-neck. 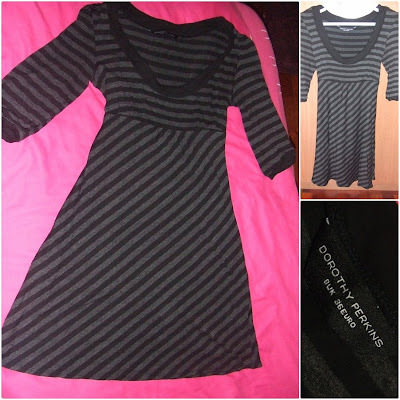 Description: A black/grey stripe V-neck tunic. 3/4 Sleeves. Back tie(exactly like the pic above). Size UK 8 (S). 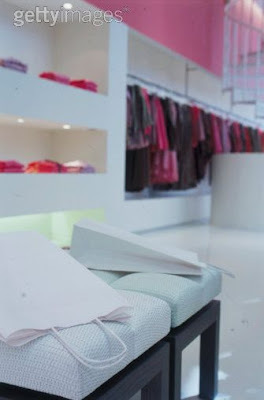 Material: 65% Viscose, 32% Polyester and 3% Elastane. Description: A nice pale blue stripes shirt with one small front pocket with logo. Very comfy. Size M. Material: 100% Cotton. 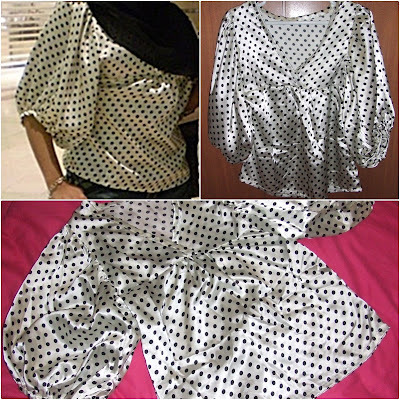 Description: A satin polka-dot top. Puffed sleeves. Size S or M. Material: 100% Cotton. 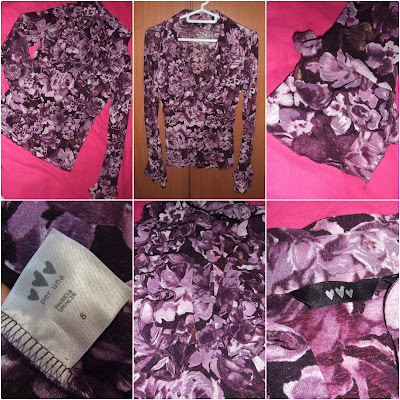 Description: A soft purple stretchable t-shirt with velvet writings in brown . 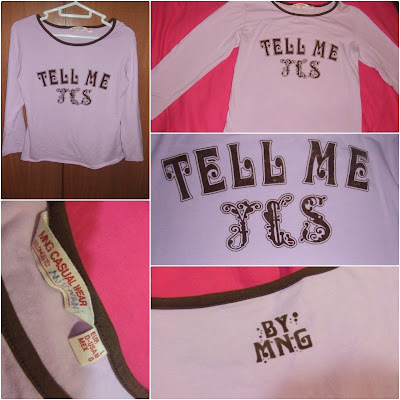 Size L. But it can only fit sized S or M. Material: 95% Cotton, 5% Elastane. Description: A really cute cropped cardy with a twist detail at the bust. 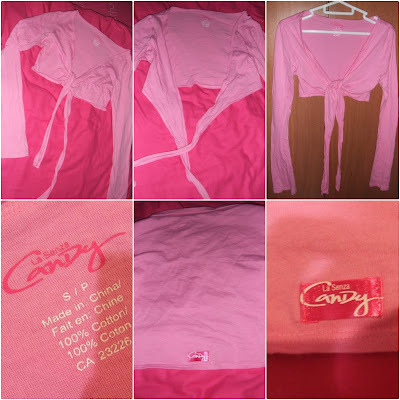 Size S. Very soft and comfy. Material: 100% Cotton. Payment must be made to my Maybank account before items can be delivered. The maximum period for reservation is 3 days. Otherwise, the items will be sold to others waiting in line. Please inform me if you wish to cancel your reservation. Prices are not including shipping and handling. Shipping and handling cost is RM 10. I will send the items via Pos Laju. (Please include your name, mailing address, phone number and the item you wish to purchase). If you have any questions or anything regarding the sales/items, please leave a message at the comment section. Thank you! email to u already. want item 9 and 10.
i email u..plase check ya..
nosa nak order no. 10 & 12. 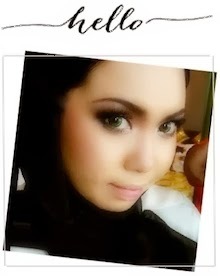 Alaaa..Tak dak yg size s or xs ke..? ala...x sempat nk beli semua sold out..sedih..